Cross Gene Experiments with Blood and Gore for "Black or White"
One of my K-pop resolutions for the new year was to challenge myself as a writer — whether that be trying out new styles of writing or exploring different groups, so I am really excited that I got a chance to do so with Cross Gene’s latest MV for “Black or White”. Having debuted in 2012, the six-member group recently came back with a mini-album titled Mirror, with the title track “Black or White”. The MV is actually deemed appropriate only for those aged 19 and above, which is fitting because of the abundant blood and gore, but more on that later! Featuring prominent use of electric guitars and blasting drums with an electro beat, this title track takes influence from rock music. It’s very fitting with the horror theme of their comeback: the vocal parts are strong and rhythmic, and the rap sections are equally as aggressive. In fact, during the rapping, a soft tinkling tune repeats in the background, adding to the horror and terror vibes. The chorus plays with quick modulations from minor to major harmony, which keeps listeners on their toes and never settled in one place. One of the letdowns of the track is that the opening verse of the song is so beautifully set up to lead up to a bombastic, killer chorus that the actual chorus is almost underwhelming. It falls flat compared to the pulsating beats and the powerful, frightening opening. Nevertheless, it’s an extremely interesting and different track from the recent comebacks in K-pop, and it’s a style that Cross Gene does pull off very well. 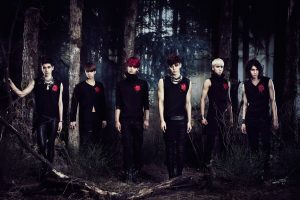 When I first saw the teasers for “Black or White”, I was immediately reminded of the Jekyll and Hyde concept that VIXX did in their early days with “Hyde” as well as by their horror concept with “Voodoo Doll” (that music video, interestingly enough, was also rated 19+). “Hyde” played with the “black versus white” and “evil versus good” binaries, which is something that “Black and White” features prominently in its music video. Fair warning, though, this music video is really not for the faint of heart: it features an unhealthy amount of blood and violence (so don’t watch it before going to bed like I did!). The storyline takes the concept of “killing your inner demons” to a literal level, as the good and pure version of the each member conquers their evil counterpart. Each member gets his own scene, which makes for learning everyone’s name a breeze and ensures that each member gets equal screen time. First up is Shin, who is lost in a bloody bathroom complete with a bathtub full of, you guessed it, blood. Oh, and if that wasn’t enough blood for you, he immediately begins to throw up blood in the sink. Terrified by the blood on his hands, he stumbles backwards desperate to get out of this mess, when his evil doppelgänger violently forces his head down the sink, effectively drowning him. Next is Casper, who is struggling to get out of his upturned car after an accident, when his wicked self saunters in with a bat and quickly begins to beat him with it. The gruesomeness is evidenced as we are treated to shots of his bruised and bloody face with his evil self laughing delightedly in the background. The gore continues as Takuya finds himself in an abandoned operating theatre, and is later stabbed by his sadistic self with a scalpel. Seoyoung sees his evil self in a shard of mirror; as his counterpart slices his neck with a piece of glass, the action is mirrored onto his own self. Sangmin is forced into a coffin as his dark doppelgänger nails him in, and Yongseok is simply picked up and choked to death. Not to worry, though, the music video does have a happy ending as the members come back to life during the climax of the song, symbolising their victory against their inner demons. I appreciate the cinematic techniques that were used to present the storyline of the video. The member’s individual scenes are all broken up and introduced in succession, and the killing parts of all the members are shown in the middle of the music video, when the music is cut off and there is only an eerie instrumental backing, which enhances the horror factor. The evil counterparts are almost always dressed in strong and dark colours while the original, “good” members are dressed in lighter ones. Sangmin’s revival is particularly enjoyable: he coolly slides the coffin open and gets up as heavy rain is falling; the rain could represent the washing away of his past as he comes out stronger and better. My only criticism of the music video is that the resurrections seem a little rushed, with each member magically rising from the dead without any struggle. If the music video is trying to show the message of conquering your inner demons, then there should be some challenges or difficulties along the way, no? 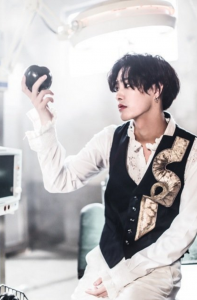 Overall, Cross Gene’s “Black and White” is a pretty impressive effort; they’ve experimented and revamped their image with a new and unique sound and style for this comeback, and it worked!